Another nice Montserrat sunset. Click the photo to see the needle we climbed. After a year living in Barcelona and about 30 days of climbing and 10 days of hiking in Montserrat time finally came to try one of the magic needles this crazy little mountain has to offer. As always I turn to Pere for questions about routes in Catalunia and as always it takes him about 10 seconds to find just the perfect route and just the perfect photo to get me motivated. This time he replied with two options for the same needle, one a little harder and one a little easier. 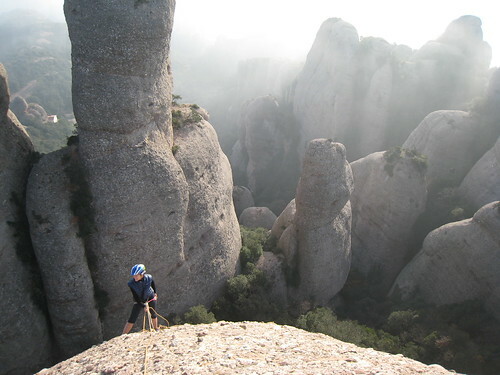 The first blog post featured this photo and I was convinced about what needle to climb. The second route seemed a little better suited for us. My girlfriend is a beginner and she has only climbed one multi-pitch route before so the grade 5 crux part I guessed would not be any problem. So the route “Om Mani Padme Hum” on “l’Agulla de l’Arbret” (Catalan for “The Needle with the Tree”) it was. We used this topo that we found on the above mentioned blog post. Clipped a bunch of quickdraws to the harness, throw the rope on the my back, loaded up my girlfriends backpack with some water and we where off. The hike in to the climb from the parking takes about 1 hour unless you’re a local. I’m lucky to have a GPS on my phone and could use the Google Maps-map that can be found in the blog post for our route. To get to the refugio is easy with plenty of signs. Then from the refugio to the actual climb, well, we had to trust the GPS 100% to get there. If you don’t have a GPS, try asking the guy who runs the refugio or buy a map of Montserrat (will be sold in our web shop). The second anchor and the surroundings. Just amazing. The climbing is completely straight forward and the the number of bolts is sufficient. If you’re not used to climbing with 5-10 meters between bolts, just keep climbing and you’ll be fine. 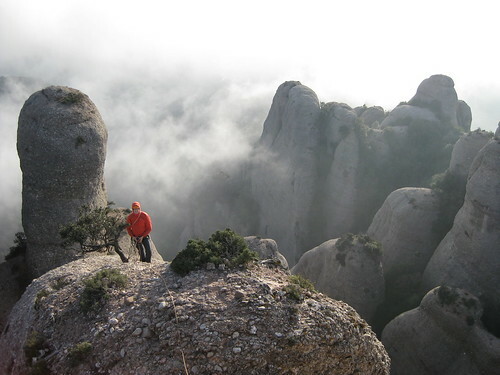 Just don’t start with doing long Montserrat-climbs on your limit, go easy and then increase the difficulty as you gain experience. This particular route is modern and the climbing was very easy, the actual crux was just a couple of meters long. The last pitch, with one bolt, takes you to the top. I clipped a sling to the tree you see in the photo above and then continued up to the highest top. I then down-climbed and brought my girlfriend up. The view from the top is truly worth the effort, looking down on the north side as the clouds finally started rolling in over us and the wind picked up… it’s hard to understand that we’re just a 45 minute drive outside the center of Barcelona. Well, after visiting the highest point she made her way down to the rapell anchor, all the time being belayed by me. This is a little scary and I wouldn’t have minded another bolt on for this. We climbed with just one 70 meter rope so we ended up doing two rapells, one 20 meter and then a 30 meter down to the ground. Packed up and headed down to the car. What an amazing afternoon! To leave the city at 12:30 and be back 6 hours later after having experienced all this. I love living in the Barcelona area! More photos from the day can be found on Flickr. 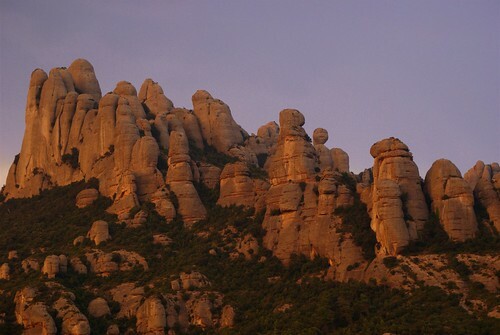 Tagged with article, conglomerate, montserrat, multi-pitch. 😀 Great afternoon! The pictures of the needles with the fog are quite mystical!